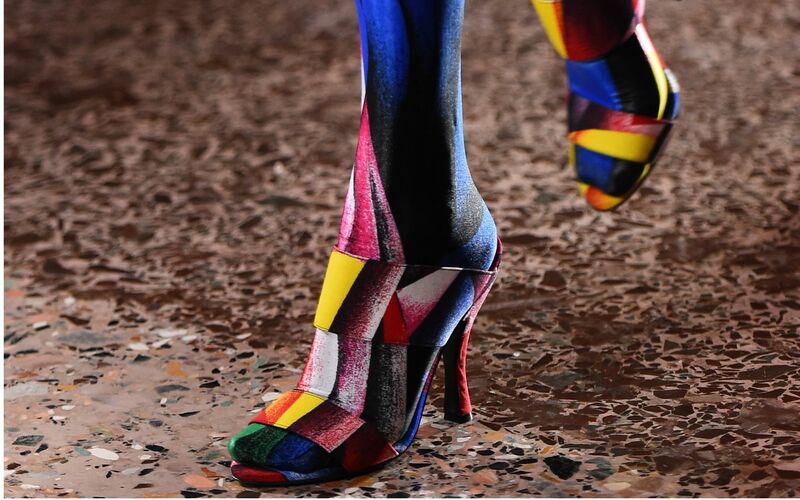 Can the era of abstract expressionism art be interpreted in a shoe design? We look at a range of wearable high-fashion shoes, from sneakers to sandals that could incite creativity in lovers of art. Romanticism is a movement that elevates emotions and the fight for liberty. The fashion and art at the time were donned with avant-garde influence much like the oil painting, 'The Swing' by Jean-Honoré Fragonard. With J'Adior stitched in gold amidst the black fabric, these Dior pumps would court the gentle and carefree hearts of romantics. Salvador Dalí pioneered 20th century surrealism in art and created vastly unconventional paintings centred on otherworldly visuals. A similar theme can be seen in Salvatore Ferragamo’s purple heels that evoke an atypical structure with a vivacious colour. Fantasy and mythical ideologies expand magical realism and Frida Kahlo is well known for her interpretation of the movement especially through her self-portraits. The Dior clogs from their autumn 2018 collection are embroidered with clashing vibrant colours and patterns to unlock the power of imagination. See also: You Can Now Shop This Exclusive Dior Lady Art Collection In Malaysia For The First Time. Non-conforming shapes and styles became the ideal ambiance for abstract expressionism and the 'Beachcomber' by Alfonso Ossorio is often quoted to describe the vexing art period. With somewhat parallel shades to the painting, Versace incorporates abstract colours in their high heels, making a statement that art can also be on the go. Read also: 15 Shoes To Make A Fashionable Point This Spring. It’s versatile and a whole other branch of pop art, neon evolved from the industry of commercial signage to expressions of art. Conjured to make a statement such as the piece titled 'No Se Puede Mirar' by Iván Navarro, these sandals from Jimmy Choo spring/summer 2019 collection reflect a futuristic dimension that’s fun and eclectic. The Palace of Versailles remains to be the cultural architecture into the lives of aristocrats like the Queen of France, Marie-Antoinette, whose portrait by Elisabeth Vigée Le Brunis is still presented at the citadel. The elegance of the Queen’s fashion can be said the same for Versace’s white and royal purple heels with Rococo elements. Women with bold red lips and blonde hair were the heroines of 60’s American pop art to highlight the intense sentiments of the period. Roy Lichtenstein’s 'Crying Girl' was created one dot at a time, inspired from vintage comic books and influences Stella McCartney’s white and bubble-gum pink faux-leather sneakers.